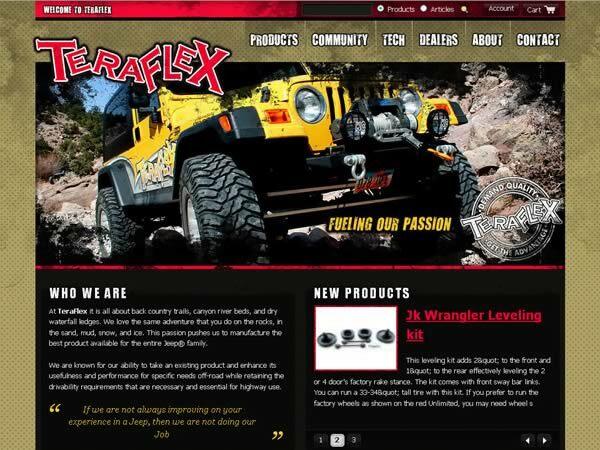 The relationship with Teraflex started 3 years ago by designing and developing their first online shop on Magento coupled with WordPress. It was a success for both since their “online business steadily increased” over the years and the community got a place to participate with their feedback and content. That was in 2008 and we just started with Magento who just turned to version 1.0, adapting to the platform, gathering experience and consuming large amounts of coffee. Before than, they had a simple static website. Why change if it works? Initial Magento & WordPress integration worked great, looked great and did function great from a frontend perspective. However, no matter how it can seam good, those are two different system. We believe it would be better to move everything to Magento and make the system more scalable and more easy to maintain. If WordPress was used only for blogging in previous version, we would have easy work. But it was used for news sections, image galleries, dealer manager and various of contact forms. 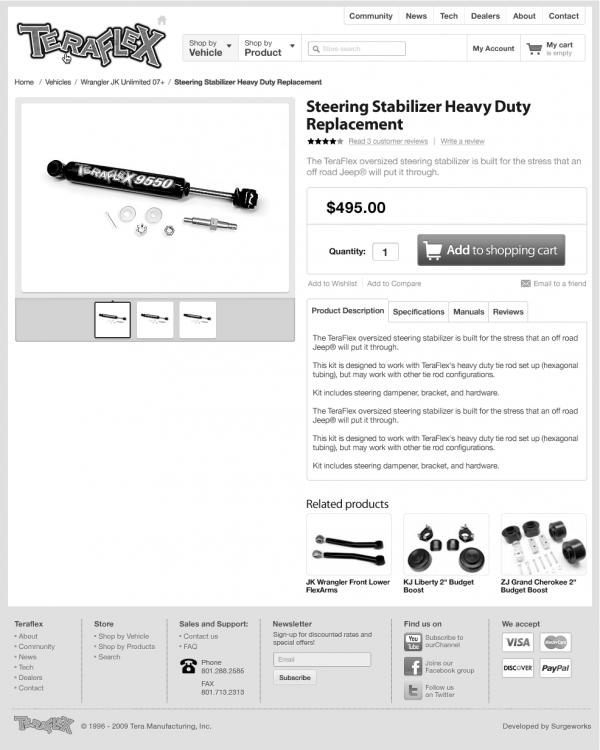 The challenge was to improve Magento with a lot of features that were outside the box. Željko was always saying that we love challenges and especially when you need to make something better because, you know, you can always make it worse. With all that input and clear direction we could start with the process of creating the site. First we created the wireframes then the actual design and at last the development of the idea in a fully functional store. I’ll just point out a few interesting things about each of the store creation phases and illustrate with actual images. Here is how the site looked like. Meeting all of these points meant that extensive research had to be done in wire-framing the site. This part played a crucial role since the actual design and later development is based on it. As usual design process started with our desiger, Renato Carvalho wire-framing the Home page. Here we would have all the global elements like header, footer and overall page grid defined and most importantly the menu system. What was accomplished here is a balance between the “Shop” and “Community” section of the site. 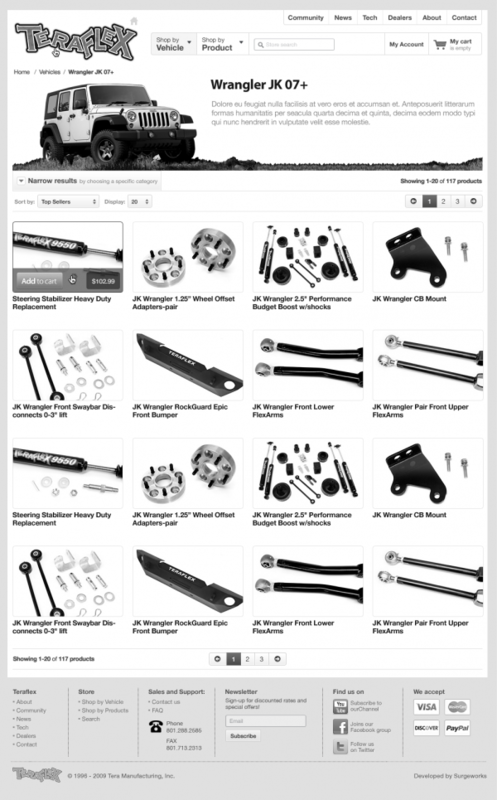 The slider below the menu for both shop and community related content, product slider and community section, all on one page. Later on we removed excess “call to action” buttons making the page easily readable and clutter free. If you compare the actual designs next in the article, you’ll see some adjustments were made during the design process to make the best layout. Once we had wire-frames ready and settled in the main theme for the site it was up to Renato to make the design “lightweight and attractive” following the first starting point. 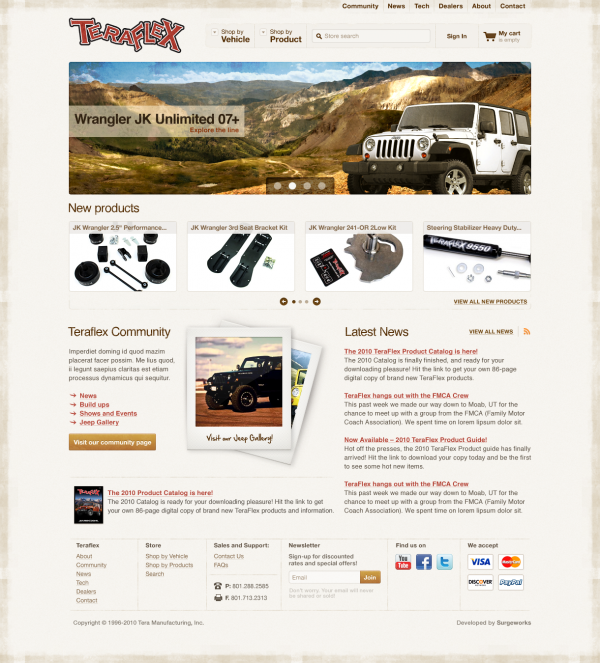 He had to design site to be usable for the Jeep loving community and shopping experience, balancing those two main aspects constantly through the entire site. Definitely not an easy task. You’ll notice, again, that there are some differences between the “live” site and this design. This was yet another intervention made with “take out unused, emphasize what’s really used” practice. Not a very catchy name but in reality it gets the job done, since we had the chance to remove the unused “Reviews” and highlight the SKU for people ordering by phone. By the time Renato finished the “Home page” our development team, meaning Ivan Lozancic, Ivica Tadic and me (Zeljko Prsa) started with the development of the overall look and feel along with the home page development. Now, usually the development phase has its burdens applying the design. However, we already did most of the work with wire-framing and final design, so we removed all unpredictable issues that could seriously slow down development. Success was in engagement of developers at early wire-framing and later design process. Why was it important? Since the creative process was done by the book, it went smoothly which saved time and money. We made a decision to start fresh with a new theme to be applied onto the existing site preserving all data about orders, products etc. This way we had a clean slate to work from. 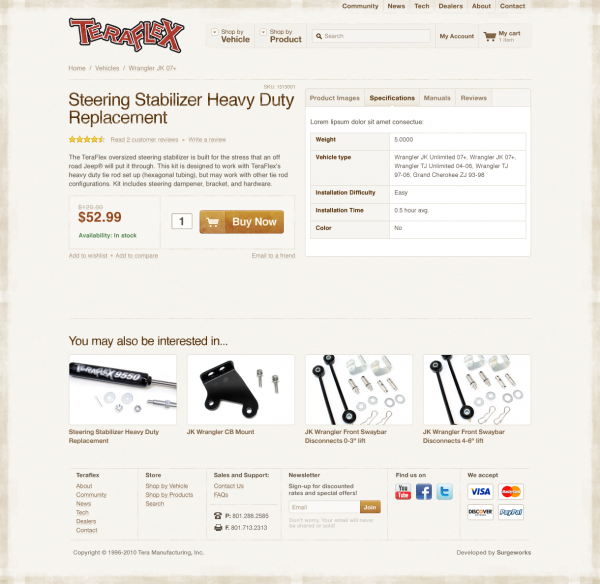 Those were main custom features of the site visible on the front-end. My favorite is the search feature Ivica developed, making it easier to find what you’re looking for. What does the Google Analytics say? All of this joint effort would be useless if we didn’t have any data about how the site works in reality. 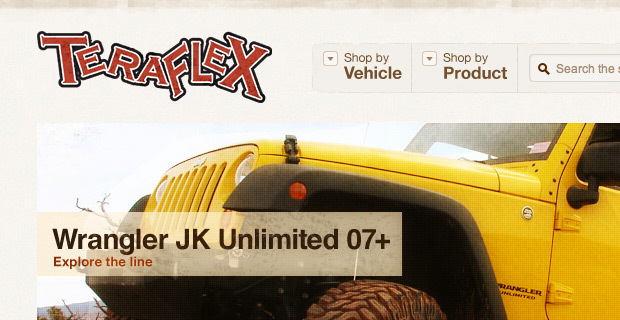 Will we get more page views, how much will visitors stay on the site, will the Jeep loving community embrace the changes and so on? And this is the date just for the first few weeks the new site has been up. It will take some more time for a worthwhile comparison and e-commerce analytics. We took a working site/online store that we built 3 years ago and made a revamp. It took a lot of effort from both sides to accomplish the goals we set but in the end we can conclude that both the client and us are very pleased with the result. Looking back at the actual process while writing this post made me realize that even though these complete projects are time and resources challenging, they are most worth while for everyone involved. We get to consult the client on every aspect of the store creation process making the best of what we have for the client while learning about their business and bringing it back into the “Store creation” process. Check the interview with Vinny Pratt, Website manager from Teraflex side about his experience with Magento and us. How much do you really blog on your Magento shop? Yeah I guess that was dumb of me to think it was the same theme. Pretty clear to me now. I think the issue is that Dan thinks that we revamped a theme in a fashion that we used the old one as starting point and recoded it to match the new design. Dan, that wasn’t the case. New theme was written from scratch and old one is dumped (both skin and frontend folders). Upgrade was really an upgrade of the actual core with some extensions. 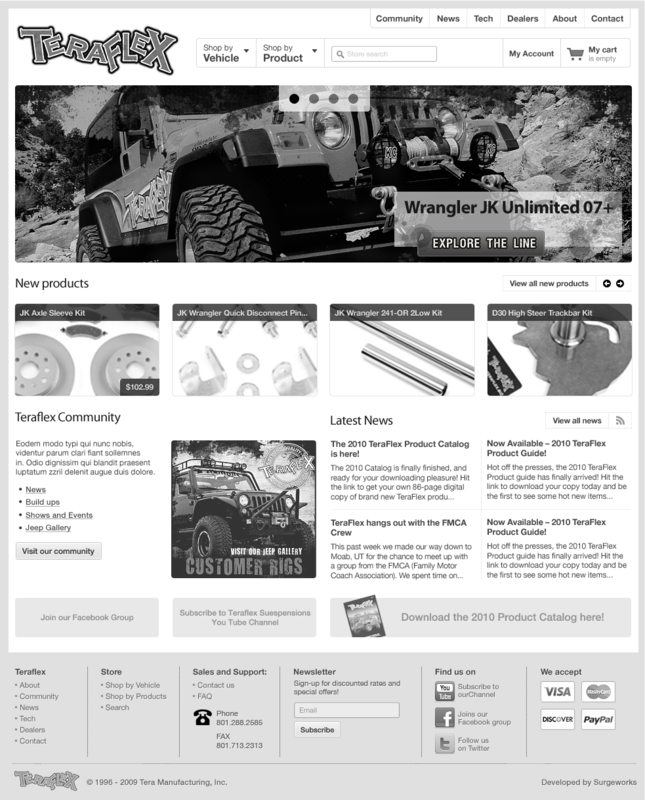 Frontend part was totally redesigned and rewritten. I don’t get how this is true, if you had to customize any of the templates you had to of copied the template and put it into your own theme directory. That being said if any fixes/addition were added to the base file, then you wouldn’t have these updates unless you added them yourselves. What is your method around this? Nice write up and new design. Did you guys upgrade the Magento version and if so what was the process you guys took and what were some of the complications that came from that? Excellent post and experience! How long does it took? Beautiful redesign! Thank you for taking the time to document the project in detail.